When you download an app on iOS or OS X, you may obtain software that works unimpeded, and for an unlimited time. But, in some cases, the app you download may offer or require that you purchase something else for it to be functional. Anything you buy after downloading an app is called an in-app purchase. Content: such as digital books or magazine issues, game levels, characters, or other modifications to an app. Functionality: such as a pro or ad-free version of an app. 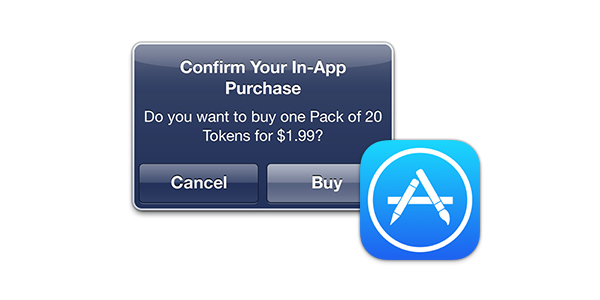 This type of IAP is often used to get around the lack of demo versions in the Mac App Store and iOS App Store. Services: things like minutes for a VoIP app, or a time-limited subscription to a feature. Subscriptions: magazine subscriptions and other types of media available within an app, as well as time limited access to certain types of content. The most prevalent, and the most lucrative type of IAP, is what is sold as functionality, and which is also considered to be "consumables." This includes extra lives, coins, or points to unlock features, and other elements of games. If you look at the Top Grossing list in the App Store—the list of apps that have brought in the most money—you can see a number of "free" apps, mostly games, that are bringing in tons of cash through IAPs. 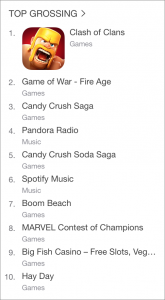 Eight of the current top ten apps above are games. (The other two are music apps, Pandora and Spotify, which sell subscriptions though their apps.) This kind of game is called "free to play," which is a tricky way to say that they are games which, while free, strongly tempt players to spend lots of money. When downloading or purchasing an app that offers IAPs, the App Store tells you this, showing a small text underneath the Download button. 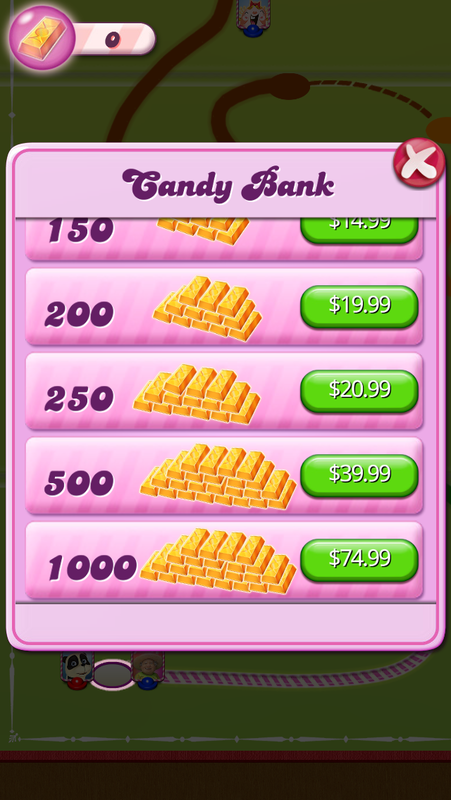 One of the more popular games, Candy Crush Saga, offers a full range of IAPs, ranging in price from 99¢ to $75. 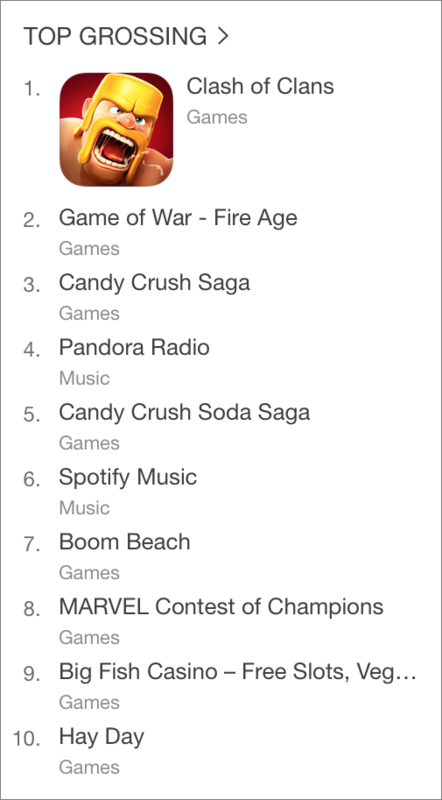 The company that makes the app pulled in more than $1.3 billion in 2014 just from these in-app purchases. In-app purchases work because they get players in the heat of the moment, when they need just one more life, or just one more move to complete a level. In some cases, spending a dollar to get to the next level seems innocuous, until you realize that you could spend ten or twenty dollars in a single game session; all this to play a "free" app. The problem with IAPs is that your kids can spend a lot of your money on them, if they use your iTunes Store account, and are allowed to make purchases. A common scenario is a busy parent who is asked to enter their password for something a child wants to download. If you don't take the time to ask what your son or daughter is downloading, and just enter your password, you may find that you've spent the price of a nice dinner. You should check the Require Password setting in iOS's Restrictions. This is the time limit that allows a user to re-download another item, or an in-app purchase, after an iTunes Store password has been entered, even for a free game. By default, this is 15 minutes, but you might want to lower it to prevent your child from downloading IAPs right after they've asked you to enter your password. We've told you how to set up parental controls on OS X and iOS, and there is one setting on iOS to allow or prevent in-app purchases, in addition to the Require Password setting mentioned just above. This can ensure that your kids don't spend hundreds of dollars buying coins for a game without realizing what they're spending. 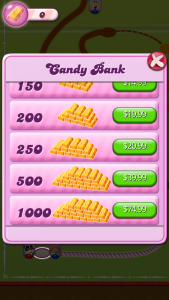 In-app purchases are generally well explained—Apple requires this—but young children, who don't realize the value of money, may just tap a button to get extras in a game, not realizing how much money they've spent. If your children are old-enough to have some idea of the value of money, you might want to set up an allowance for them on the iTunes Store. This lets them manage their money, and they'll quickly learn how long it lasts with some of these games. In-app purchases aren't entirely a bad thing, but these games are designed to generate large amounts of money through small, spur-of-the-moment payments. Be aware of what this means, so you can keep your kids from spending too much. This entry was posted in How To, Software & Apps and tagged apps, IAP, In-App Purchases, iOS, iTunes Store, OS X. Bookmark the permalink.